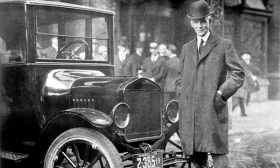 DETROIT — On July 27, 1917, Henry Ford responded to customer demands by introducing a model that fastened an open bed behind the cab of his popular Model T car. He called it the Model TT, and it sold for $600. It may have been his most important business decision since founding the company that bears his name. Today, the success or failure of Ford Motor Co. rests in the bed of its F-series pickups. The F series is Ford's most profitable vehicle — five years ago, Morgan Stanley estimated that it single-handedly generated 90 percent of Ford's global profits — and it has managed to outsell its rivals for four consecutive decades. 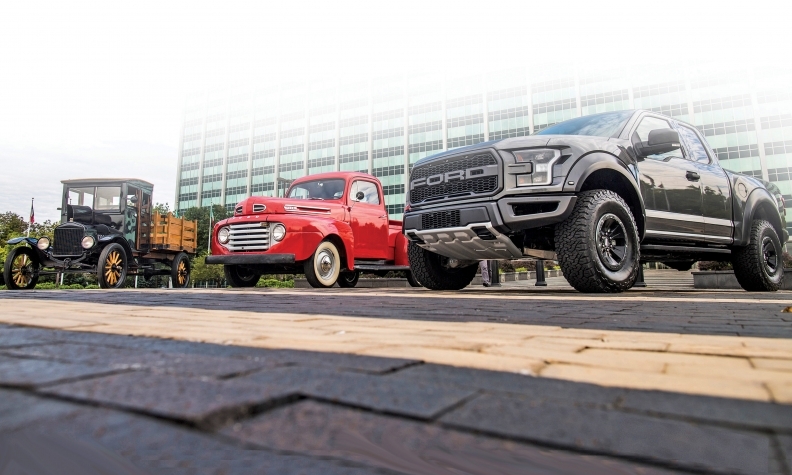 Over the last 100 years, Ford became such a dominant seller of pickups because of the myriad choices it offered consumers, said Karl Brauer, executive publisher of Autotrader and Kelley Blue Book. "It's the fact that they so early on recognized a market for trucks and were one of the first ones to support a wide range of truck styles," Brauer told Automotive News. "It's that breadth of configurations that has continued to prove one of its major advantages." The Model TT, which logged 209 sales in its first calendar year, was made with a chassis that could accommodate third-party beds, allowing for a wide range of uses. It quickly became popular with farmers and other workers in rural areas. Henry Ford was no stranger to trucks. Before he founded his company, he worked at Detroit Automobile Co., where one of his first ventures was production of a delivery truck, although it did not sell well, and the company eventually folded. The Model TT was a different story. Ford says it had sold 1.3 million pickups by 1928. That year, it replaced the TT with the Model AA, a pickup with a 1.5-ton chassis. It came in two lengths and with new powertrain and axle options for greater capacity. Five years later, Ford replaced it with the Model BB. Two years after that, in 1935, Ford introduced the Model 50 pickup, which came with a flathead V-8 engine. "That really gave it some extra power," said Bob Kreipke, corporate historian for Ford. "Now it was able to carry even heavier loads, and you could build bigger boxes on the back." Things changed with the onset of World War II, when Ford switched to wartime production of bomber planes and military vehicles, including Jeeps. Following the war, Ford benefited from a booming economy, and its president, Henry Ford II, vowed to make Ford the pickup sales leader. Sensing an opportunity as rural families moved to cities to find work, and soldiers returned home, Ford in 1948 launched its F-series Bonus Built trucks, which ranged from the half-ton F-1 to the Class 7, 3-ton-rated F-8. "They helped rebuild America," Kreipke said. Ford ads promoted the trucks by citing statistics showing that buyers could expect them to last 10 years. No one at Ford is sure who is responsible for the original F-series styling. More than likely it was Bob Gregorie, Ford's first design chief, says retired Ford engineer Jim Wagner, of Plymouth, Mich., author of the book Ford Trucks Since 1905. Gregorie left Ford in 1946, but Wagner says the 1948 F series was well underway by that time. The styling of the 1948 model was a complete break from the past. More importantly, Ford recognized that consumers wanted more comfort. Ford designers paid extra attention to the seats — which had more padding and a separate, adjustable backrest — the ventilation system and wide-opening doors. "The truck became kind of accepted and suddenly became things you didn't mind going to church on Sunday in, either," Kreipke said. The second-generation F series arrived in 1953 with power improvements and a new naming convention. The F-1 became the F-100, while F-2 and F-3 trucks were integrated into the new F-250 line. The F-4 became the F-350. Class 8 trucks were spun off into a new C-series commercial truck unit that produced C-, H-, L-, N-, T- and W-series Ford trucks. That year, Ford began offering more special features, including armrests, dome lights and sun visors. The trucks came with two-tone paint, automatic transmissions and an improved heater and radio. During that time, Kreipke said, Ford expanded its pickup marketing to younger buyers who could use the vehicles for a day at the beach or a romantic picnic with their sweethearts. In the 1960s, it offered the Falcon Ranchero — a car-based pickup billed as "More Than a Car! More Than a Truck!" Kreipke said it helped pave the way for the smaller Ranger pickup in 1982. While Ford outsold its rivals in pickups in the United States in the early 1970s, Chevrolet was the leader from 1973 to 1976. Ford replaced the F-100 with the F-150 nameplate in 1975, and the name has stuck to present day. In Canada, the F-Series has been the best-selling line of trucks for 50 years, from 1966 through 2016. Ford reclaimed the U.S. sales title in 1977 — and hasn't given it up since. That year, a copywriter for a Ford trucks magazine is said to have coined the phrase "Built Ford Tough." "The success of our truck line has been that we've constantly tried to see what the customer wants in that vehicle and then keep raising the bar," Kreipke said. "To sustain sales, you have to constantly upgrade your product." Not every change went over well with customers. Rounded "jelly-bean" styling introduced in the 1997 model year was abandoned during the next redesign after sales began to slide. In 1998, Ford introduced the Super Duty name for the F-250 through the F-750, which mainly were used for commercial businesses. In the following years, it added more expensive trim levels with fancier interiors and more technology. In 2011, Ford pickups first came with an EcoBoost V-6 engine that increased fuel efficiency without sacrificing power. The most important recent update happened in 2014, when Ford gutted its massive F-150 plants in Dearborn, Mich., and Kansas City, Mo., to retool them for building pickups with a body made of aluminum instead of steel to slash weight. It was a costly and risky decision, and though rivals such as General Motors have attempted to portray the aluminum body as weak, the changeover happened relatively smoothly, and sales continued to rise. More recently, the automaker has added a 10-speed transmission and a host of driver-assist features. 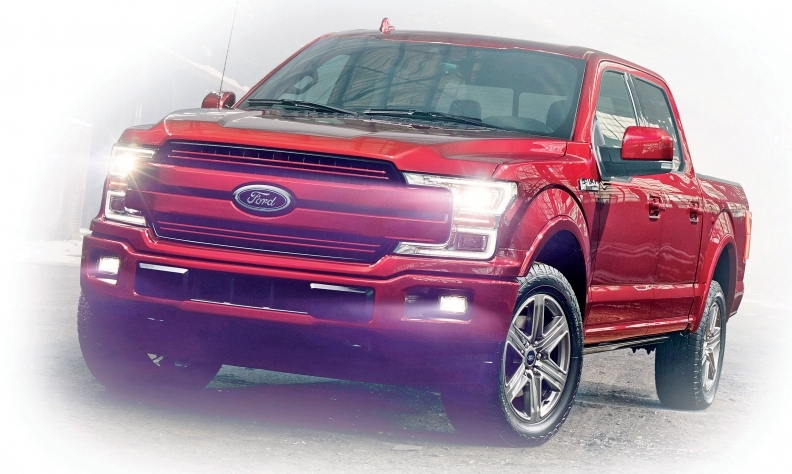 It has a diesel version of the F-150 on the way soon. Ford is reintroducing the Ranger midsize pickup to the U.S. in 2019 and, at the end of the decade, it will add a hybrid variant of the F-150. "They're certainly positioning themselves to maintain a pure tech advantage over their competitors, and they also have a strong brand loyalty," Brauer said. "They have everything in place to maintain their dominance, but they do have to do what they've been doing, which is aggressive innovation. It'd be easier than ever for a competitor with a superior product to sway buyers away from Ford." Pickup buyers are known to be extremely brand loyal, Brauer said. But that loyalty does have its limits. "It's harder to maintain than ever before," he said. "We've found that customers have a willingness to simply find the best deal versus always sticking with the same brands. Even the truck market is subjected to that reality." More challenges could be on the horizon. As Ford and other automakers work to develop autonomous-vehicle technology, the trucking industry is widely regarded as a prime candidate to adopt self-driving systems. Ford has said its first autonomous vehicles could be used for commercial uses such as package delivery, although it hasn't specified what kind of vehicles those would be. Brauer cautioned that Ford could fall behind if another company introduces a self-driving pickup that fleet businesses and other customers would want. "If they can't keep pace with the autonomous technology," he said, "it could threaten their dominance." Richard Truett contributed to this report.